Join Martin Falk Lind and his family to Abborrträsk outside Arvidsjaur. 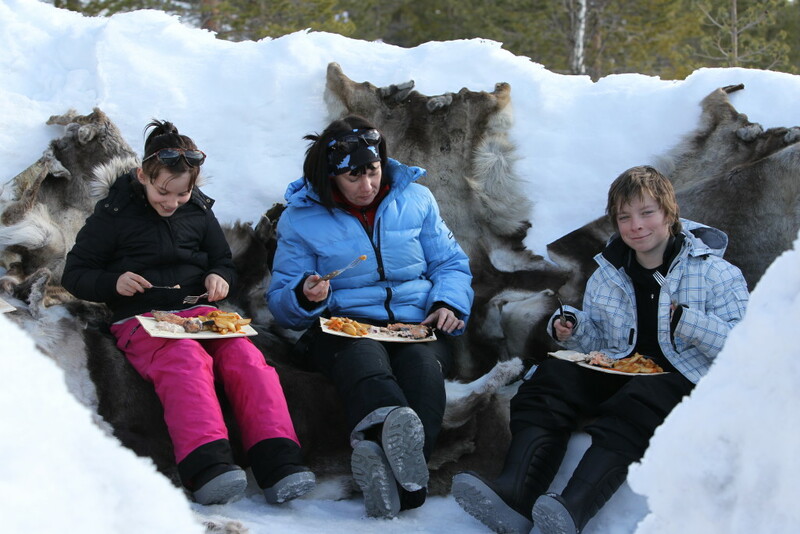 Here you’ll find knowledgeable guides, good food, soft reindeer skins and warming huts. And lots of arctic char in mega format! FOREST, FORESTS, FOREST. 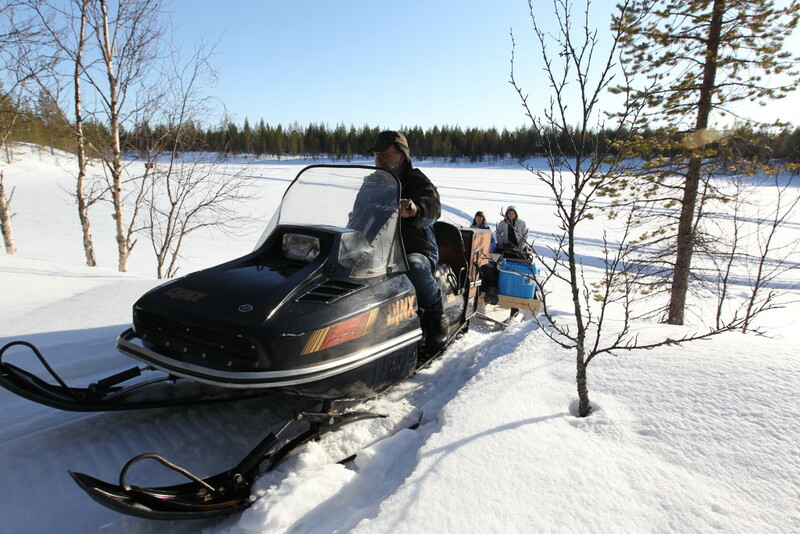 To travel through the inland of Swedish Lapland is a monotonous story. Therefore, we have – like so many other southerners with the mountains as a goal – never really stopped. Why should you? Instead of stoping, we have raced further west to where the landscape finally opens up and the mountains appear. It would require a kidnapping of the Fiskejournalens chief editor Martin Falk Lind to change this. Now, after the kidnapping, we know that behind the dark green wall of forest, isn’t only Swedish Lapland, but also thousands of fishing grounds. Many virtually unfished. For while the Lapland’s interior has almost been forgotten both as a tourist and fishing destination, many of the older generation of fishermen has disappeared. Thus, much of the fishing with nets has disappeared and by that the lakes have been untouched and fish populations have grown up. – And I’ve got many over one kilo, you must book the whole family on the night train up to Easter. Now I must hurry if I should get to my lecture in Arjeplog. Bye. We booked and got the Good Friday’s last seats. At 04:30 the train stops at Jörn station. A dazed family is dressed and sqeezed into Sonny Holmgren bus, just to to be tucked under a reindeer skin in a snowmobile sled a while later. Our sleep drunken brains begin to slowly take in the snowy landscape, and slowly begin to understand that we are far from our home in Gothenburg. We are on a ice fishing adventures outside the village Abborrträsk in Arvidsjaur, Swedish Lapland. A dim light displaces the darkness of the night and soon the smell of an open fire appears. Hot chocolate and coffee gives an awakening effect. 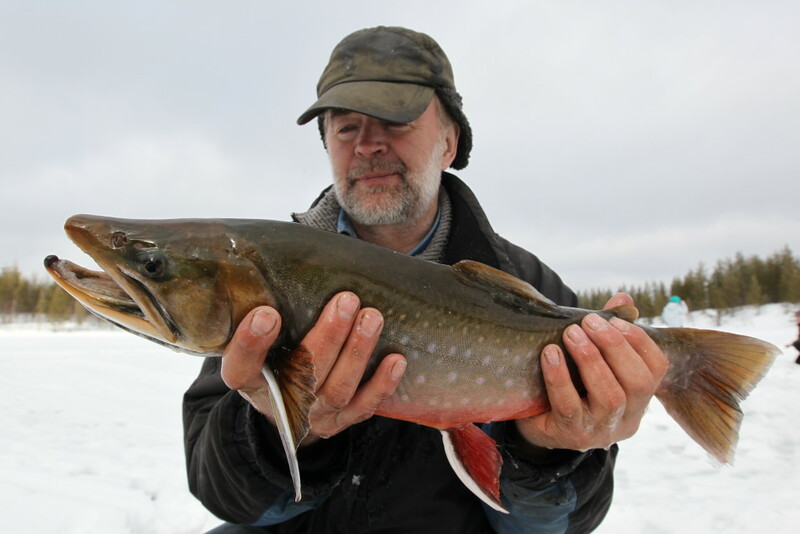 Sonny drives up our expectations by constantly talking about all the great arctic char in the lake. Martin tries for educational reasons curb the stories a bit, so that the children will understand that there are never any guarantees when it comes to fishing. But Sonny spreads and promises both one kilos and even two kilos chars. According to him, they are endless and grotesquely large and he says it’s “Fish guarantee”. – I understand you were skeptical about this, I whisper to Martin. – It sounds like pure bull stories. Are you sure it was not a coincidence that the fishing was so good the last time? We start by drilling up a big hole for underwater filming. We want a submersible camera on the bottom and if we are lucky we will see arctic char swim by it. After that we drill holes for the kids and put them on a reindeer skin each, so we can continue to focus on our underwater camera. It is not long before Andrea is screaming that something is biting. A fine 0,4 kg female arctic char is pulled out of the hole and her happiness is total. – It was a little one, Sonny says. Martin and I look questioningly at each other. First, it is a really nice fish and second, it is her first ever arctic char. It could very well be the only fish she gets, and even the whole family. Such things have happened before. There is no such thing as a fish guarantee. The area we are fishing in is called Tjärnheden. It is a so-called “dead ice”-area where old chunks of ice from the inland ice remained long after the ice had disaperad in other places. It was covered with gravel and slowly melted down and then formed lakes. Tjärnheden is about one square miles and includes 365 lakes, one for each day. We see directly into our underwater camera that the water is full of small white, swimming spots and banana-like plankton. Probably both mysis and gammarus, nutritious crustaceans that fish love. Perhaps the crustaceans come naturally, perhaps they have been brought here. Both crustaceans and fish have been moved to ponds since the Stone Age to enhance access to food and to grow the fish population. Some of the lakes here are rich in pike and perch, others on char and trout and some are empty. Sonny has some lakes he manage by himselves. Here he has made sureethat it is an abundance of fish. Sonny also grow their own fish which he regularly puts into the lakes he manages. The fish eat and live in the lake and no fish is allowed to be taken home, but if you want to eat an occasional fish while fishing it’s sure okey. The underwater equipment is in place and with the help of virtual glasses we can also see that the camera sees. The show can begin. Sonny lowers a fishing lure with a maggot on the hook. Martin film and refers like a sports reporter everything he sees. Martin sees a shadow approaching. A curious char is headed for glare of the lure. The fish circles around it and after a final lap is approaching.- Raise a little! Make some jerk … Martin tells Sonny.- Now it has lost it’s the interest, no, it turns. Lower a bit! Vibrate. Vibrate! VIBRATE! Now it is close to, now, now, now … NOOO! It’s gone … Soon we all stand around the filming hole and take turns looking in the glasses. That’s how exciting it is. We get one epiphany after another. There are lots of fish passing, but most just looking. 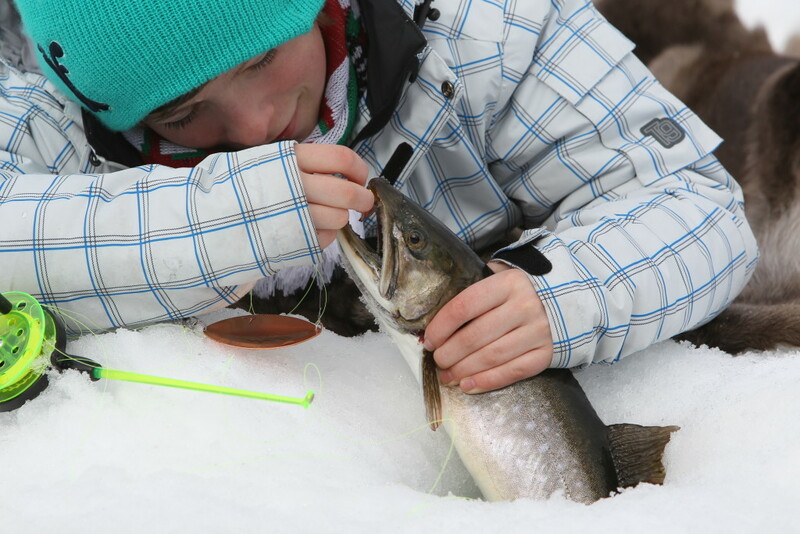 If we wouldn’t have had a TV channel down to the bottom we might have thought that “there’s no fish.” Many trout are really interested, but when we think are going to bite, they turn around. Some fish are trying to eat on the glare, but don’t even look at the maggots. Other individuals are quite focused on eating on the bottom and plowing through the image to focused to even look up. We decide put the maggots on a jig instead and suddenly the interest level increases and arctic char begin strike. Arctic char seems to like new things. We note that they get bored easily if we stop moving the bait or if it becomes too monotonous. They also get tired quickly to new colors and shapes. But how much stimulation can they withstand before they get intimidated? We put on a sharp blinked light, which also is rattling against the lure plus a jig with lots of maggott. And this is something you have to see with your own eyes! Sure, this is a behavior documented during two days in April so no scientific conclusions can be drawn, but it’s definitely worth taking a look at. Sonny proves to be one of the most friendly and geniunt caring people you could imagine. So now you might wonder why they did something so drastic as to kidnap Martin Falklind a winter night in February. Well, they simply wanted to know if their little char lakes was something to bet on. Because they aren’t that active in the sport fishing world they wanted to get someone that is active to try them out. Is the lakes at Tjärnheden something to visit? I think the pictures speaks for themselves. Lots of fish, big fish, strong fish. And an ice fishing season that lasts throughout April. 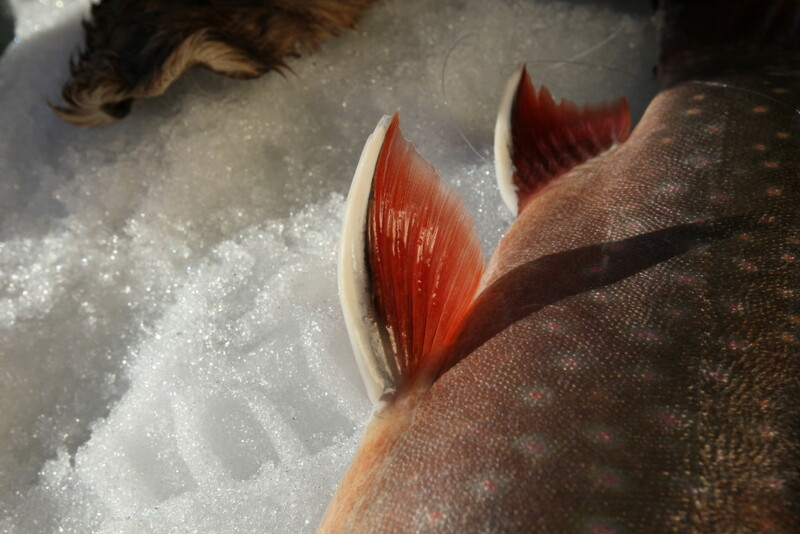 This is arctic char fishing from its sunniest side. It is difficult to understand that these are the same fish that drive one to insanity with its selective way during the summer months. But wait! Maybe Tjärnhedens arctic char is equally happy even during the summer? Sonny wants us to visit during the summer months and try the fishing during that time aswell. The answer will come in a few months time. The next night train to Jörn is booked in the end of June, and that time the fly fishing rods will be packed.